October is proving to be very complicated from an Infosec perspective, so I am publishing this timeline in the middle of the turmoil in the wake of the breach that has affected TalkTalk. 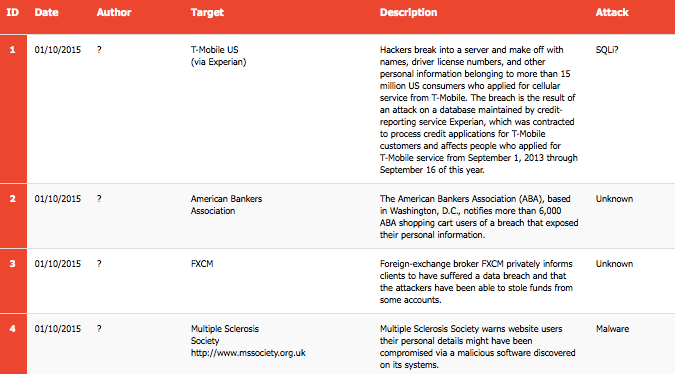 Unfortunately this month has started in the worst possible way with the massive breaches targeting T-Mobile US (result of a cyber attack to Experian affecting potentially 15 million US users) and Scottrade (affecting 4.6 million users). In particular the attack to Scottrade has not been isolated, delineating a possible trend: other two companies operating in the same space, FXCM and E-Trade, have revealed to have suffered similar attacks. But the bad news does not end here, and the case of Dow Jones & Co. is paradoxical: the company has disclosed the details of two breaches in the space of a single week. Moving to Cyber Espionage, this fortnight reports the discovery of an APT using fake profiles on Linkedin (Threat Group 2889) and the revelations of a 2014 cyber attack against the South Korea subway system, purportedly orchestrated by North Korea. Other remarkable events include the DDoS attacks against two major Japanese airports (Narita and Chubu) executed by the Anonymous Collective in name of #OpKilling Bay (the campaign against the dolphin slaughter) and against several Belgian Government websites executed by the local branch of the same collective. http://www.davidjones.com.au Premium retailer David Jones says its website has been hacked and private customer data stolen. 11 05/10/2015 ? Peppermill Resort Spa Casino An undisclosed number of individuals are being notified that an attack may have compromised credit and debit cards used between October 2014 and February 2015 at the front desk of the Reno, Nev.-based Peppermill Resort Spa Casino. AnesonGib, W2S, Nepenthez, Nick28T, Bateson87, matthdgamer Six of the most successful Fifa video gamers to feature on YouTube are targeted by cyber-thieves, who are able to steal millions of Fifa coins, the in-game currency, and deleted valuable players. The attackers are thought to have convinced manufacturer EA Sports to transfer their victims' Origin accounts to email addresses they controlled. http://www.parlbruparl.irisnet.be/ The Belgian branch of the Anonymous collective takes down the official websites of Belgian Prime Minister Charles Michel, the Brussels parliament and the website of Federal Public Services Home Affairs. 29 13/10/2015 ? Daily Mail Malwarebytes discloses in a blog post that the "sophisticated" attack, previously documented as targeting eBay and Yahoo, has now turned its attention to the Daily Mail, a popular UK-based news publication which accounts for millions of monthly visitors. https://www.usuhs.mil A hacker going with the online handle of Kuroi SH defaces several domains of the United States based Uniformed Services University and leaks 2014 login credentials online.